Learn more about their potential to lower risk of cardiovascular disease, hypertension, cancer, type 2 diabetes, and obesity. Despite the recommendations in the 2010 Dietary Guidelines for Americans to consume more whole grains1 and the growing body of evidence indicating that regular whole grain consumption could help protect against the development of certain chronic diseases, such as cardiovascular disease, metabolic syndrome, type 2 diabetes, and cancer,2 consumers still may be confused regarding what whole grains are, how they can improve health, and how they can be incorporated into their diets. This continuing education activity examines the health benefits of eating whole grains and provides recommendations for RDs to suggest to their clients and patients who want more whole grains in their diet. Whole grains include the entire grain seed, called the kernel, which consists of three components: bran, germ, and endosperm. If the kernel has been cracked, crushed, or flaked, it must retain the same relative proportions of these components to be called a whole grain.1 Examples of whole grains are bulgur, oats, brown rice, buckwheat, corn, and quinoa. Refined grains have been processed (milled) to remove the bran and germ to create a finer texture and improve shelf life, but this process removes the dietary fiber, iron, and many B vitamins. To make enriched refined grains, the B vitamins and iron are added back in. More than one in three American adults have at least one type of cardiovascular disease.8 The evidence for the protective benefit of whole grains against cardiovascular disease is strong,2 and epidemiological studies from North America and Europe consistently have shown that consuming whole grains is associated with a reduced risk of cardiovascular disease.9 For example, both the Iowa Women’s Health Study10 and the Nurses’ Health Study11 found that as whole grain consumption increased, the risk of coronary heart disease decreased. Diabetes affects an estimated 25.8 million American adults, and 90% to 95% of these people have type 2 diabetes. An additional 79 million Americans have prediabetes, according to the National Diabetes Education Program. Epidemiological studies indicate that people who consume more whole grains have improved insulin resistance and a decreased risk of developing type 2 diabetes, even after taking into account factors such as age, calorie intake, and BMI.19,20 Studies also have found an association between whole grain consumption and fasting glucose and insulin levels14,21-23 as well as the risk of developing type 2 diabetes. According to the Centers for Disease Control and Prevention, almost one-third of adults and one in five children and adolescents between the ages of 6 and 19 are obese,29 increasing their risk of numerous health conditions, including hypertension, adverse lipid concentrations, and type 2 diabetes. However, not all studies have found a connection between reduced obesity risk and whole grain consumption. A recent unpublished review presented at the 2012 Whole Grains Summit that analyzed 25 controlled trials of whole grains vs. non-whole grains showed inconsistent results that didn’t support the findings in prospective studies. The researchers suggested the fat loss could have been attributed to lower postprandial insulin and glucose responses that favor lipolysis and lipid oxidation rather than fat storage. The lack of difference in weight loss between the groups, the researchers proposed, was likely the result of a smaller effect of the whole grains than anticipated as well as a larger variation in weight loss than predicted in the group. • food structure that reduces transit time. While the majority of population studies show a positive association between whole grain consumption and a reduced risk of several chronic diseases, relatively few intervention studies have been done, and not all of them have shown the same positive results. Ideally, long-term intervention trials would be performed, but that may be unrealistic because of the long-term nature of the development of chronic diseases and the resulting costs of conducting such studies. Despite inconsistencies in research findings regarding whole grains, health organizations, nutrition experts, and the federal government recommend that everyone increase their consumption of whole grains. The 2010 Dietary Guidelines for Americans urge everyone to make at least one-half of the grains in their diet whole grains. Make clients and patients aware that grain foods labeled “multigrain,” “wheat bread,” “bran,” “wheat germ,” “unbleached wheat flour,” “100% wheat,” or “organic flour” do not guarantee a whole grain product. The two easiest ways for clients and patients to know they’re getting whole grains is to look for products that list whole grain first on the ingredient list, though even that may not be an accurate indicator of foods that contain several grains, or to look for the Whole Grain Stamp created by the Whole Grains Council, which is a nonprofit consumer education organization. There are two Whole Grain Stamps, the basic stamp and the 100% whole grain stamp, which are designed to clearly mark those products that contain either at least 8 g of whole grains per serving but may contain refined grains (the basic stamp) or at least 16 g of whole grains per serving and all of its grain ingredients are whole grain (the 100% whole grain stamp). The recommended number of grams per serving is 16 g, and the recommended number of whole grain grams per day is 48 g.
• Have instant oatmeal at breakfast, adding their own fruit or sweetener to maintain the healthfulness. • Enjoy popcorn as a snack but without dousing it in butter. • Serve corn on the cob or canned corn as a side dish. • Mix their usual refined breakfast cereal with a whole grain cereal, gradually increasing the amount of whole grain cereal. • Choose whole grain bread, rolls, buns, pitas, or tortillas for sandwiches, hamburgers, hot dogs, wraps, and tacos. • Choose whole grain crackers for snacking. • Add barley or brown rice to canned soups and stews. • Serve wild rice as a side dish. • Substitute one-half of the white flour with whole wheat flour when they bake cookies, muffins, and pancakes. • Add 1/2 cup of cooked bulgur, wild rice, or barley to bread stuffing. • Buy whole grain pasta. The 2011 Nutrition and You Trends Survey, conducted by the Academy of Nutrition and Dietetics, determined that in the last five years, 45% of those surveyed said their consumption of whole grains had remained the same; 48% said it had increased; and 7% said it actually had decreased during that time, yet 71% reported that they consume enough whole grains. When the International Food Information Council asked consumers which of the Dietary Guidelines they were interested in acting on, only 37% cited “increasing whole grain consumption,” highlighting the disconnect between recommendations and motivation to take action. Among the barriers—some real and some perceived—to increasing whole grain consumption are taste (dryness and bitterness), texture (more firm), difficulty in obtaining whole grains when eating out, cost, and time constraints when preparing whole grains at home.37 Dietitians can introduce clients and patients to products that contain smaller amounts of whole grains, which are familiar in taste and texture to refined grains yet still contribute to their intake of whole grains. RDs should recommend whole grain products, such as instant oatmeal, quinoa, whole grain couscous, and quick-cooking brown rice, which require minimal cooking time. In addition, they can help clients identify restaurants and fast-food venues that offer whole grain options. The evidence for the health benefits of consuming whole grains appears strongest for reducing the risk of cardiovascular disease. Studies also suggest a connection between the consumption of whole grains and a reduced risk of colon cancer and type 2 diabetes. The evidence is less convincing for the prevention of obesity. While the findings of population studies are strong and convincing, results of clinical intervention trials have been inconsistent to date. However, enough evidence exists to suggest that RDs should advise their patients to consume three servings of whole grains (48 g) per day. For the most comprehensive information on whole grains research, products, restaurants that serve whole grains, and resources for clients and patients, visit The Whole Grains Council website (www.wholegrainscouncil.org). — Densie Webb, PhD, RD, is a freelance writer, editor, and industry consultant in Austin, Texas. Statement of Potential Conflict of Interest: The author provides consulting services to General Mills, Inc.
1. Describe the difference between whole grains and refined grains. 2. Propose three dietary recommendations for whole grains. 3. Evaluate five diseases/conditions common in the US population that can be reduced by consuming whole grains. 4. Assess some of the barriers to increasing the consumption of whole grains. 5. Provide clients and patients with whole grain choices and ways in which they can incorporate them into their diet. 1. Refined grains contain which of the following? 2. How many grams of whole grains must be in one serving in order for a product to receive the 100% whole grain stamp? 3. Which of the following is perceived as an obstacle to whole grain consumption? a. Lack of access to recipes calling for whole grains. b. The grains have an unappealing color. c. Not many stores carry whole grain products. d. Belief that whole grains have a dry texture and bitter taste. 4. The regular consumption of whole grains has been associated with a reduced risk of which of the following? 5. According to the Atherosclerosis Risk in Communities study, consuming three daily servings of whole grains reduced the risk of coronary artery disease by what percentage? 6. Epidemiological studies suggest that consuming whole grains improves insulin resistance and decreases the risk of type 2 diabetes. 7. Which of these components of whole grains has been researched more extensively than the others for gastrointestinal health benefits? 8. Studies indicate that regular consumption of whole grains significantly reduces the risk of obesity and weight gain. 9. Which of the following is a good way to incorporate whole grains into the diet? a. Choose products labeled as multigrain. b. Choose products made with organic flour. c. Buy baked goods made with unbleached wheat flour. d. Have instant oatmeal at breakfast. 10. Which of the following is among the possible mechanisms by which whole grains may prevent disease? 2. Jonnalagadda SS, Harnack L, Liu RH, et al. Putting the whole grain puzzle together: health benefits associated with whole grains—summary of American Society for Nutrition 2010 Satellite Symposium. J Nutr. 2011;141(5):1011S-1022S. 3. Okarter N, Liu RH. Health benefits of whole grain phytochemicals. Crit Rev Food Sci Nutr. 2010;50(3):193-208. 4. Liu RH. Potential synergy of phytochemicals in cancer prevention: mechanism of action. J Nutr. 2004;134(12 Suppl):3479S-3485S. 5. Adom KK, Sorrells ME, Liu RH. Phytochemicals and antioxidant activity of milled fractions of different wheat varieties. J Agric Food Chem. 2005;53(6):2297-2306. 6. Lang R, Jebb SA. Who consumes whole grains, and how much? Proc Nutr Soc. 2003;62(1):123-127. 7. Slavin J. Whole grains and human health. Nutr Res Rev. 2004;17(1):99-110. 8. Roger VLK, Go AS, Lloyd-Jones DM, et al. Executive summary: heart disease and stroke statistics—2012 update: a report from the American Heart Association. Circulation. 2012;125(1):188-197. 9. Seal CJ, Brownlee IA. Whole grains and health, evidence from observational and intervention studies. Cereal Chem J. 2010;87(2):167-174. 10. Jacobs DR Jr, Meyer KA, Kushi LH, Folsom AR. Whole-grain intake may reduce the risk of ischemic heart disease death in postmenopausal women: the Iowa Women’s Health Study. Am J Clin Nutr. 1998;68(2):248-257. 11. Liu S, Stampfer MJ, Hu FB, et al. Whole-grain consumption and risk of coronary heart disease: results from the Nurses’ Health Study. Am J Clin Nutr. 1999;70(3):412-419. 12. Steffen LM, Jacobs DR Jr, Stevens J, Shahar E, Carithers T, Folsom AR. Associations of whole-grain, refined-grain, and fruit and vegetable consumption with risks of all-cause mortality and incident coronary artery disease and ischemic stroke: the Atherosclerosis Risk in Communities (ARIC) Study. Am J Clin Nutr. 2003;78(3):383-390. 13. Nettleton JA, Steffen LM, Loehr LR, Rosamond WD, Folsom AR. Incident heart failure is associated with lower whole-grain intake and greater high-fat dairy and egg intake in the Atherosclerosis Risk in Communities (ARIC) study. J Am Diet Assoc. 2008;108(11):1881-1887. 14. Ye EQ, Chacko SA, Chou EL, Kugizaki M, Liu S. Greater whole-grain intake is associated with lower risk of type 2 diabetes, cardiovascular disease, and weight gain. J Nutr. 2012;142(7):1304-1313. 15. Mellen PB, Walsh TF, Herrington DM. Whole grain intake and cardiovascular disease: a meta-analysis. Nutr Metab Cardiovasc Dis. 2008;18(4):283-290. 16. Wang L, Gaziano JM, Liu S, Manson JE, Buring JE, Sesso HD. Whole- and refined-grain intakes and the risk of hypertension in women. Am J Clin Nutr. 2007;86(2):472-479. 17. Tighe P, Duthie G, Vaughan N, et al. Effect of increased consumption of whole-grain foods on blood pressure and other cardiovascular risk markers in healthy middle-aged persons: a randomized controlled trial. Am J Clin Nutr. 2010;92(4):733-740. 18. Sacks FM, Svetkey LP, Vollmer WM, et al. Effects on blood pressure of reduced dietary sodium and the Dietary Approaches to Stop Hypertension (DASH) diet: DASH-Sodium Collaborative Research Group. N Engl J Med. 2001;344(1):3-10. 19. Liese AD, Roach AK, Sparks KC, Marquart L, D’Agostino RB Jr, Mayer-Davis EJ. Whole-grain intake and insulin sensitivity: the Insulin Resistance Atherosclerosis Study. Am J Clin Nutr. 2003;78(5):965-971. 20. Pereira MA, Jacobs DR Jr, Slattery ML, et al. The association of whole grain intake and fasting insulin in a biracial cohort of young adults: the CARDIA study. CVD Prevention. 1998;1:231-242. 21. Nettleton JA, McKeown NM, Kanoni S, et al. Interactions of dietary whole-grain intake with fasting glucose- and insulin-related genetic loci in individuals of European descent: a meta-analysis of 14 cohort studies. Diabetes Care. 2010;33(12):2684-2691. 22. Meyer KA, Kushi LH, Jacobs DR Jr, Slavin J, Sellers TA, Folsom AR. 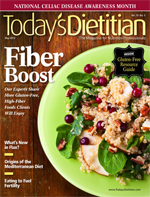 Carbohydrates, dietary fiber, and incident type 2 diabetes in older women. Am J Clin Nutr. 2000;71(4):921-930. 23. Montonen J, Knekt P, Järvinen RJ, Aromaa A, Reunanen A. Whole-grain and fiber intake and the incidence of type 2 diabetes. Am J Clin Nutr. 2003;77(3):622-629. 24. De Munter J, Hu FB, Spiegelman D, Franz M, van Dam RM. Whole grain, bran, and germ intake and risk of type 2 diabetes: a prospective cohort study and systematic review. PLoS Med. 2007;4(8):e261. 25. Larsson SC, Giovannucci E, Bergkvist L, Wolk A. Whole grain consumption and risk of colorectal cancer: a population-based cohort of 60,000 women. Br J Cancer. 2005;92(9):1803-1807. 26. Schatzkin A, Mouw T, Park Y, et al. Dietary fiber and whole grain consumption in relation to colorectal cancer in the NIH-AARP Diet and Health Study. Am J Clin Nutr. 2007;85(5):1353-1360. 27. Aune D, Chan DSM, Lau R, et al. Dietary fibre, whole grains, and risk of colorectal cancer: a systematic review and dose-response meta-analysis of prospective studies. BMJ. 2011;343:d6617. 28. McIntosh G, Noakes M, Royle P, Foster P. Whole-grain rye and wheat foods and markers of bowel health in overweight middle-aged men. Am J Clin Nutr. 2003;77(4):967-974. 29. Chronic diseases and health promotion. Centers for Disease Control and Prevention website. http://www.cdc.gov/chronicdisease/overview/index.htm. Accessed September 8, 2012. 30. Liu S, Willett WC, Manson JE, Hu FB, Rosner B, Colditz G. Relation between changes in intakes of dietary fiber and grain products and changes in weight and development of obesity among middle-aged women. Am J Clin Nutr. 2003;78(5):920-927. 31. Koh-Banerjee P, Franz M, Sampson L, et al. Changes in whole-grain, bran, and cereal fiber consumption in relation to 8-y weight gain among men. Am J Clin Nutr. 2004;80(5):1237-1245. 32. Harland JI, Garton LE. Whole-grain intake as a marker of healthy body weight and adiposity. Public Health Nutr. 2008;11(6):554-563. 33. Kristensen M, Toubro S, Jensen MG, et al. Whole grain compared with refined wheat decreases the percentage of body fat following a 12-week, energy-restricted dietary intervention in postmenopausal women. J Nutr. 2012;142(4):710-716. 34. Giacco R, Della Pepa G, Luongo D, Riccardi G. Whole grain intake in relation to body weight: from epidemiological evidence to clinical trials. Nutr Metab Cardiovasc Dis. 2011;21(12):901-908. 35. O’Neil CE, Nicklas TA, Zanovec M, Cho S. Whole-grain consumption is associated with diet quality and nutrient intake in adults: the National Health and Nutrition Examination Survey, 1999-2004. J Am Diet Assoc. 2010;110(10):1461-1468. 36. Hur IY, Reicks M. Relationship between whole-grain intake, chronic disease risk indicators and weight status among adolescents in the National Health and Nutrition Examination Survey, 1999-2004. J Acad Nutr Diet. 2012;112(1):46-55. 37. Adams JF, Engstrom A. Helping consumers achieve recommended intakes of whole grain foods. J Am Coll Nutr. 2000;19(3 Suppl):339S-344S.